A lesson we can learn from A Prairie Home Companion -- sometimes a quirky little movie with a stellar director and a slew of fun performances can be completely ignored by, well, everybody. And one of the many headliners in this crew was Ms. Streep, playing Midwestern folksy singer Yolanda Johnson. Thanks to director Robert Altman's affinity for big casts with lots of overlapping banter, Streep gets to engage in some superb witticism with the likes of Lily Tomlin (who plays her singing sister Rhonda), Garrison Keillor (dry as ever, and playing himself with brilliance), and Lindsay Lohan (yes, you heard correctly) as her daughter Lola. Another nice perk to this movie: there is a LOT of singing. 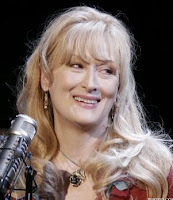 So a soundtrack full of down-home country music and slow-jam acoustic numbers, Meryl gets to showcase her special talents as a nuanced vocalist. And "Goodbye to My Mama" has to be one of the best on-screen musical performances I've seen. Sure, there are some weak spots on the soundtrack (Lohan's "Frankie and Johnny" isn't so awesome, and Woody Harrelson and John C. Reilly's "Bad Jokes" is really only funny the first time you hear it), but thanks to Streep, Keillor, and real-life show regulars Jearlyn Steele and Robin and Linda Williams, it's a pretty solid soundtrack by most standards. All in all, buoyed by Streep and Tomlin (and not so much by the silly performances by Kevin Kline and Virginia Madsen), A Prairie Home Companion is a rousing, if slow-moving and trudging, ensemble piece. Now explain to me how it managed to get away with no nomination for Best Cast at the SAGs?